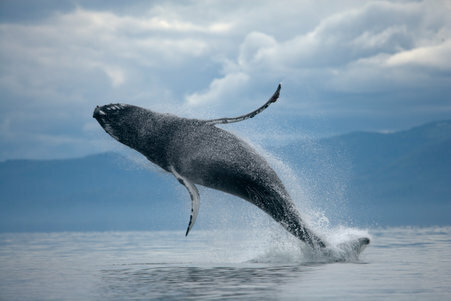 Male humpback whales are the concert singers of the marine world. These ocean giants belt out tunes that can be heard perhaps hundreds of miles away. The songs attract friends and lovers, and maybe keep rivals at bay. And now we learn that humpbacks in different ocean basins—the South Atlantic and the Indian, on opposite sides of the African continent—share melodies. "The songs are certainly learned between individuals. It's thought to be the best example of horizontal cultural transmission—so from peer to peer, rather than from parent to offspring." Melinda Rekdahl, Marine Conservation Scientist with the Wildlife Conservation Society’s Ocean Giants Program. The International Whaling Commission has identified seven distinct humpback whale breeding populations in the Southern Hemisphere. These are whales that meet up in the same warm tropical waters each year to mate and give birth. But when mating season is over, the whales migrate to the chilly polar regions to gorge on krill. Using genetics and photographic surveys of migrating humpbacks, researchers know that males in those colder feeding areas interact with other males from different breeding populations. But scientists did not know that this meetup presents the whales with the opportunity to have vocal jam sessions—where they trade melodies. "It makes sense that in some years there may be different oceanographic conditions, more patchily distributed prey, that may mean populations or individuals may have to move further to find food. And that might bring them into closer contact with neighboring populations and facilitate song exchange." The findings present researchers with new opportunities to understand how culture is transmitted among animals. But it also allows even greater insight into the workings of populations of humpback whales. "It shows you connectivity potentially on yearly timescales, which is what genetics information doesn't." Genetic data can show that different populations had historical interactions. But songs can reveal how two populations interact on a much faster timescale. By combining song information from these populations with whales that breed off the Atlantic coast of Brazil, Rekdahl says researchers can gain a more comprehensive understanding of the dynamics of global humpback whale culture. "Humpback whale song is an incredibly unique and complex display…and it's quite amazing how complex it is, and how it is such an amazing example of culture in animals."